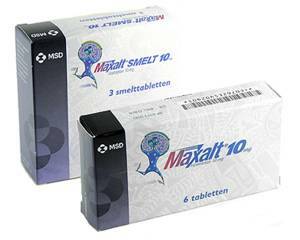 Maxalt 10 mg melt tabl. What is Maxalt used for? Maxalt is a type of medicine called a serotonin agonist, commonly known as a ‘triptan’. It is a painkiller specifically used to relieve migraine attacks. The active ingredient, rizatriptan, relieves the symptoms of migraine by causing the blood vessels in the brain to narrow. Maxalt is for adult use only. Hypersensitivity to light and sound. The onset of a migraine may be preceded by an aura: visual disturbances such as flashing lights, zigzag patterns or stars. Some people also experience motor paralysis symptoms, such as pins and needles or tingling sensations in the arms or legs. Maxalt is available in the form of tablets and orodispersible tablets. The tablets should be taken with water. The orodispersible tablets are designed to dissolve on the tongue. Maxalt should be taken at the first signs of headache. Maxalt only works after the migraine has started. It will not prevent the migraine. Adults: one tablet at a time. Take another tablet if the headache comes back within 24 hours. Leave at least two hours between doses. Do not take more than 20 mg a day. This medicine is not suitable for use in children. Read the package leaflet before use. Fatigue, sleepiness, dizziness, feeling of weakness. For a complete list of possible side effects, see the package leaflet. Consult a doctor if the side effects are severe. Be sure to tell the doctor what other medicines you are taking when you order. This is to avoid potential interaction and to make sure that the combination with Maxalt is safe. Maxalt should not be used by women who are pregnant, planning to conceive or breastfeeding. Ask your doctor to prescribe a safer alternative. This medicine may cause dizziness or fatigue. Stay out of traffic if you experience these side effects. Alcohol can make side effects such as dizziness worse and set off a new migraine episode. You should therefore avoid drinking alcohol while taking Maxalt.